Do you feel you have sensitive skin and tough beard? Does your profession require you to drum up military shaves, daily? Clap, clap. You are not alone. Almost every new wet shaver out there is looking for the best safety razor for sensitive skin. But not everybody has tough beard and super-sensitive skin. Even after factoring that in, it is always a safe place to start. The joy of wet shaving can go to the dogs with a sorry first purchase. I have seen too many of these instances for one lifetime (can’t let that happen to you). Open comb or closed comb safety razor! which one is preferable for sensitive skin? 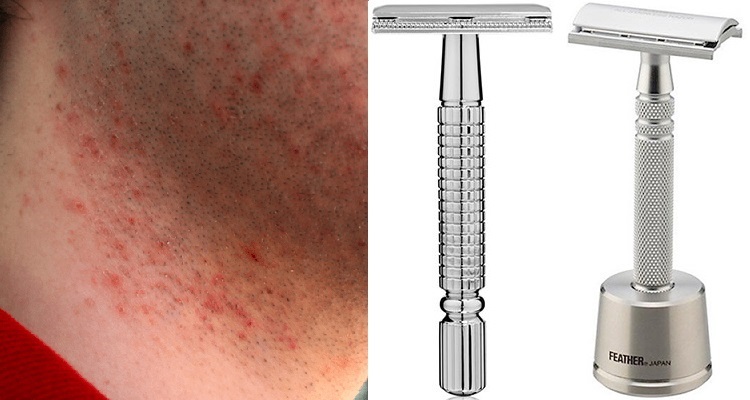 What characteristic you’ll look for when buying a safety razor for sensitive skin? What makes the merkur heavy duty double edged razor a better choice than the rest? Like we said in our article on the most aggressive safety razors, open-comb and close comb razors have been designed to be different. Open-comb razor designs are more aggressive, while most closed combs are suited for various skin sensitivities. While aggressive wet shaving is best achieved with open combs, you should always invest in closed comb safety razors if you have sensitive skin. Such designs have a protective metal layer that prevents direct contact of the skin and the blade. Also, some closed comb designs have adjustable head angles that can work better on sensitive skin. Does it expertly engineered for sensitive skin? Nothing is more important than the engineering that goes into creating safety razors. Take out the engineering from it and it is all just metal and blade. The trick here is, you will not often know about the engineering put in the razor merely by looking at it. It is important to read a detailed review for that. Is the shaver evenly balanced? A direct result of superior engineering in razors is impeccablebody balance. Good razors are balanced such that you do not have to exert excessive pressure for close shaves. On several occasions, extra pressure from the user causes razor bumps. And that can happen all the time with poorly balanced razors. Does it have super-max comfort grip? Razors for wet shaving cannot do without good and lasting grips. You do not want your razor to drop into the sink (and take a healthy chunk of skin) midway through the session. Also, some razors may have terrific grip but could be too large or too small for your hand. So look for a grip that suits your hand size. Does it help to eliminate razor burn, nicks, cuts and skin irritation? This is where we come to the meat of the issue. A good razor for sensitive skin will take care of all kinds of cuts, nicks and skin irritation. But you should not leave it on the razor alone. Consider investing in one of the better shaving gels for sensitive skin too. Does it improve your skin tone and complexion? This might sound slightly unnatural to the uninitiated. But a good razor for sensitive skin adapts to your skin over time. It works actively toward the repairing of the skin. Such healing action could do wonders to your skin tone and complexion. Check out some of the best razors for skin tone before the purchase. Is it easy to use? Shaving sensitive skin can be a pain in itself. Upon that, you do not want something that is not easy to use. Easy handling is a must for razors meant for sensitive skin. Most of this is ensured if you get one of the really well-balanced safety razors. That cuts out half the chase. The Heavy Duty Merkur razor for sensitive skin is the very best you can achieve when looking for a safety razor for sensitive skin. To flag it off, the Heavy Duty means what it sounds. It is for terrific military shaves day in and day out. It works well for African American skin and does not cause even the slightest of issues when you are on duty. If you have an ingrown-hair issue, it really cannot get better than the Heavy Duty. 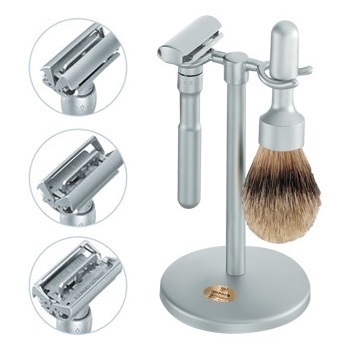 The shaving action of the Merkur HD is both simple and distinctly effect. The shirt and stout build of the razor gives you maximum control over its movement. It never gets too heavy to handle as you get a great grip as well. The chrome finish only completes the look of the razor like none other. All this is perfectly complemented by the genuinely effective blade angle of the razor. Check out other unbiased user reviews Here! Short and stout design for control. Does not cause razor burns. Slightly difficult for larger hands. Chrome chips get off after a while. 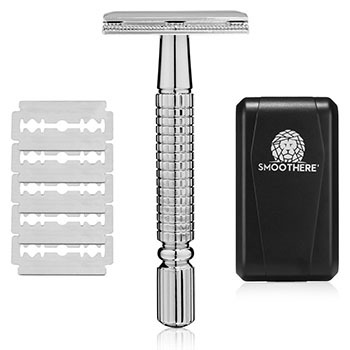 The double edge razor kit from Smoothere was not custom built for sensitive skin albeit addressing skin sensitivity was a consideration made by the makers. However, we have been pleasantly surprised at what this razor can do for you if you have sensitive skin. The design has been weighted expertly and exquisitely and is super comfortable when you feel it in the hand. The razor minimizes the risk of nicks and cuts and gives you finish that is extra close and comfortable. 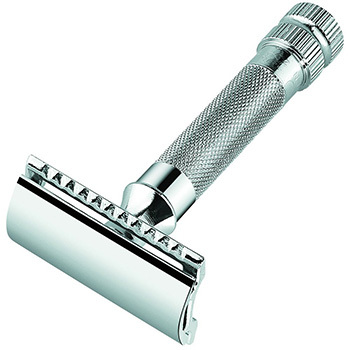 If you have the bad habit of dropping the razor in the shower, you will like the great texture that the handle offers. The Smoother razor makes addressing sensitivity for wet grooming very easy in many ways. The chrome plate finish on the metal is of high quality and will not fall off anytime soon. There is added protection from corrosion and rust and it makes the purchase last very long. Click to see current pricing on Smoothere Here! Soft action on sensitive skin. Takes very less time to adapt. 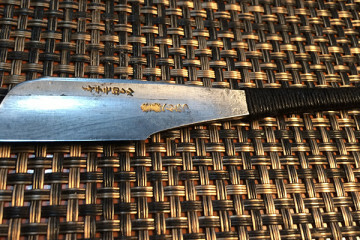 Could be very sharp for beginners. 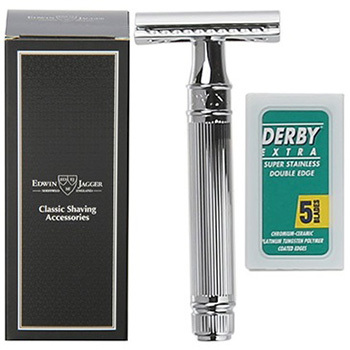 The DE89Lbl safety razor from Edwin Jagger is in our list today for a very simple reason – it cares for sensitive skin. While it is severe on bears of all toughness, the performance for sensitive skin is outstanding. The head of the razor fits most effective safety razor blades. On test, we found that a lot of the sensitivity support of the razor has to do with the balance of the body. We though the company has done a great job at balancing the weight of the razor in the DE89Lbl. The DE89Lbl is also adequately durable. Some of you may be misled with the cheeky chrome design that might make it look like a novice. However, we would like to assure you the build quality is indeed strong and there is no reason this should not last you a couple of years. The DE89Lbl performs all the better if you use a custom shaving gel for sensitive skin. Great body balance and design. Takes very less counter space. Excellent aesthetics with the chrome finish. Finish could have been better. Quality control issues may exist. 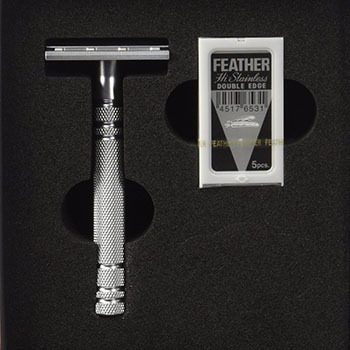 The Feather Seki Edge razor is a true champion when it comes to dealing with sensitive skin. You like every feature of the razor, starting with the handle that gives a distinct metal feeling as you weight it on the hand. You can feel the grip of the handle a lot better when you are actually shaving. Exquisiteness of craftsmanship and quality is visible in the razor as soon as you hold it. The handle of the Feather is sufficiently long at 3.5 inches. The total stainless steel body of the razor makes sure it lasts you quite a while before you are done with it. Also, you do not have to buy those insanely expensive cartridges once you decide to invest on this piece of metal. The Feather Seki Edge also reminds you of the shaving that used to happen in the olden days with a hint of tradition displayed all over the razor. Beautiful finish on the body. Textured grip for extra hold. Has a blade compatibility issue. Not for beginners in DE shaving. The Futur Adjustable razor from Merkuris a decent double edge design that is distinctly differet from something like a Heavy Duty. The handle of the Futur Adjustable is a lot curvier and artistically made though. 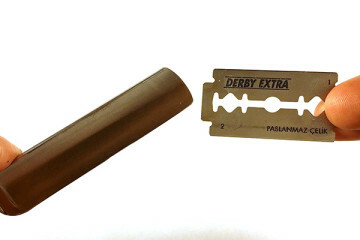 The Double Edge designof the razor allows you to use both the edges simultaneously and you may derive maximum benefit from your razor this way. The beautiful satin finish on the razor means that you get a break from the chrome design for once. The shave quality you get with the Futur Adjustable is extremely close. You will like how the build of the razor helps in making the shaves closer for you. The major difference between this and other safety razors is in the shaving adjustment that is offered for the head. The head can adjust at different angles to the different contours of your face. This makes it twice more effective when dealing with sensitive skin. Check price >> Merkur Futur Here! Great grip with a curvy handle. Adjustable head might not suit all. Not for very large hands. The Merkur HD is simply better than all the safety razors we have reviewed so far vis-à-vis performance on sensitive skin. While most razors we reviewed performed exceptionally well on sensitive skin, the HD came out with the closest shaves. It performed amazingly well on Afro-American skin type and is simply brilliant on ingrown hair. And all this tough action comes with utter softness on the skin. That is what makes the HD stand out. Safety razors for sensitive skin should be selected very carefully and once you are through with the purchase, make the right use of the product.